The question I get asked the most regarding hummingbirds is “How do I keep the bully hummingbird from dominating my feeder?” Unfortunately, hummingbirds do not have the “share gene” like we humans are typically taught by our parents and teachers. 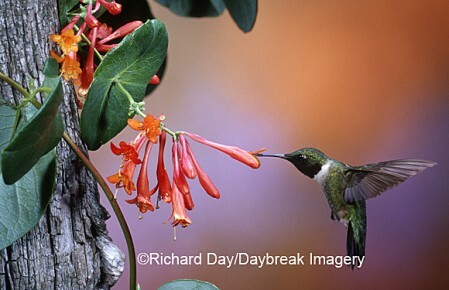 When they find a reliable source of food, they want it and are usually not willing to share with other hummingbirds. Years ago the theory was to put out more feeders on the other side of your house so the birds couldn’t see each other. But if you have a square or rectangular-shaped house, that means you probably would only have 4-8 birds fighting over those feeders. I don’t know about you, but I’m greedy too and I want LOTS of hummers in my yard! I planted dozens of nectar flowers for them and for many years we saw maybe 10-20 hummingbirds each summer. 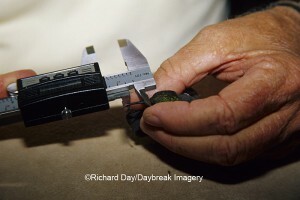 When I was doing research for my book, The Wildlife Gardener’s Guide to Hummingbirds & Songbirds From the Tropics, back in 2000, I interviewed about 100 people and asked them questions about their birds. I used that info in the book to share with others what worked for these folks. One guy I interviewed was Bob Sargent, a long-time bird bander, founder of the Hummer/Bird Study Group, and author of Ruby-Throated Hummingbird, a Wild Bird Guide published by Stackpole Books. 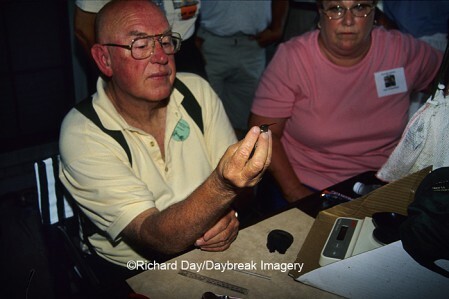 Bob and his wife, Martha have been studying and banding hummingbirds for many years. When Richard and I were speakers at the Rockport-Fulton Texas Hummer/Bird Celebration many years ago, we met the Sargents, and have since become good friends. 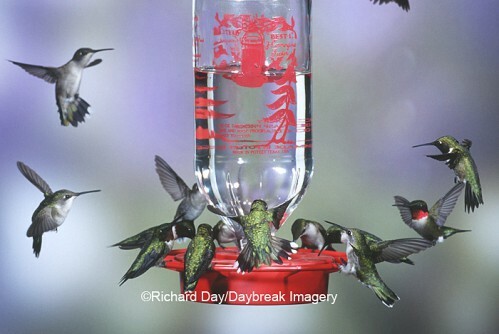 Now according to Bob, the way to attract more hummingbirds is to put out more feeders. And rather than separate them as I used to, he says they should be clustered together. When the birds all feed in a central area at numerous feeders, a dominant bird cannot hog a feeder. So a few years ago I decided to take Bob’s advice and every year I’d add 10-12 more feeders. And you know what? Bob is absolutely right! Each year our numbers have increased, and this year we have more hummingbirds than ever. We now have 12 bottle feeders hanging from hooks under the eaves around our enclosed back porch where Richard and I eat all our meals. People have asked if birds fly into the windows with feeders so close to the house and it has not been a problem. We spend time on our gazebo that overlooks our hummingbird gardens and have 24 feeders hanging in the shade there as well. Another cluster is beneath our redbud tree near the gazebo, and we have others on another deck near our living room. All are in partially or fully shaded areas because this is what hummers prefer, and it also keeps the nectar from spoiling as quickly as in full sun. Hang them about head high, if possible, so you don’t need a ladder when refilling. 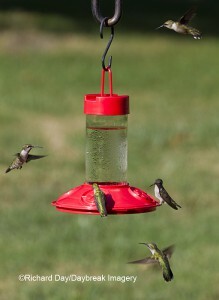 This also keeps predators, such as cats, from having access to hummingbirds on feeders. This past week has been amazing with more birds than we’ve ever seen in our yard! Sunday Richard replaced 6 of the 8-ounce feeders around our back porch with 6 32-ounce ones because we were filling the 8-ouncers every day! We used to see one bird at a feeder at a time—at least briefly until another one chased it away. Now it’s common to see 2-3 birds sharing a feeder and that is really really neat to watch! 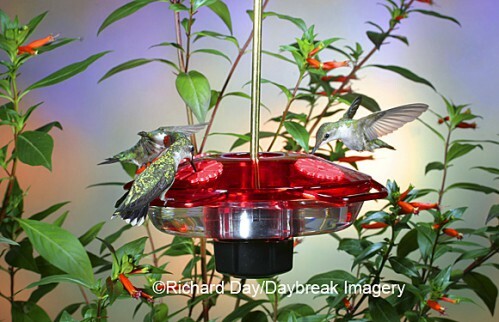 I’m often asked what types of hummingbird feeders are the best? Well, it depends on who you talk to. There are basically 2 styles—the vertical bottle style and the horizontal basin style. Bottle feeders are just that, a gravity-fill bottle with ports on the bottom where the birds can access the nectar. Basin style feeders, sometimes called flying saucers, are like covered bowls with holes on top for the birds to drink from. Hummingbirds will use either type. No matter which style or brand you use, it’s a good idea to examine a feeder in the store before making a purchase. I prefer feeders with clear glass or plastic reservoirs so I can monitor nectar levels. 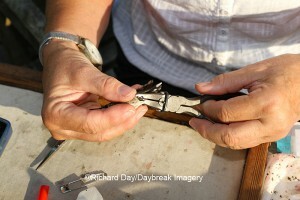 Take it apart and put it back together to see how it works. 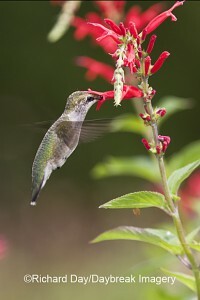 If you’re lucky and attract swarms of hummingbirds to your yard, you’ll be doing this every few days all summer. While you’re at it, check for loose parts or potentially tough spots to keep clean when the feeder gets dirty. Pretend you’re filling it and carrying it outside—is it awkward to disassemble and reassemble? Will you lose half the juice (and have a sticky floor to clean later) before you get it out of the kitchen? Feeder manufacturers are constantly improving their designs, and shopping for a hummer feeder can be like searching for the perfect mouse trap. Choose a size that’s appropriate for the number of birds you have. If you’re just starting out and haven’t seen many birds, start with a small feeder or one that you can regulate the capacity to the numbers of birds you have and not waste nectar. Remember, however, that the more feeders you have out, the more birds you’ll attract. HummZinger Excel basin style feeder by Aspects. 2-pieces that snap apart and are very easy to clean. 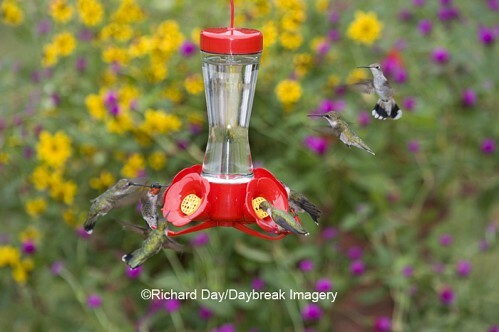 At Daybreak Imagery we use a variety of different hummingbird feeder styles including some from Droll Yankees, Aspects, and Dr JB’s. Our primary feeders are Best 1 because they are easy to fill and clean, are inexpensive, and they don’t leak when the wind blows them—which it does all summer in Illinois, the prairie state. 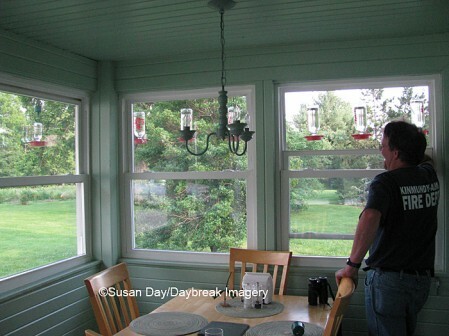 We have Jewel Box Window Feeders made by Aspects on our office windows. I don’t have a photo of them, but they slip onto a window with little suction cups—and it sure brings a smile to my face to have hummingbirds just a few feet away from me as I work on my computer! Hummer/Bird Study Group offers a large variety of hummingbird feeders, including Dr JB’s, plus spare parts for Perky Pets feeders. 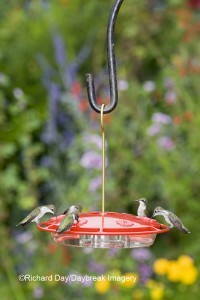 Our next blog post will cover where to put your feeders and what to do when the birds fight over your feeders. Stay tuned! And be sure to let us know when the hummers arrive at your place! You are currently browsing the archives for the hummingbirds category.